This nightstand arrived in one piece and was easy to unpack. The drawers slide without effort. I am not sure if I will keep the hardware drawer pulls or swap them out. Overall, this appears to be well made. I am glad that I purchased this piece. Classically beautiful and masterfully crafted, this transitional style nightstand offers a timeless design that will last through the ages. The silver-tone ring pulls pop against the rich espresso finish for a sophisticated, yet casual look fit for any bedroom. Dimensions 29.13 In. X 17.0 In. X 29.0 In. This looks fine but not great quality. The wire brushing is coarse in places where cleaning cloth snags. Top and drawer fronts are sanded better than frame. Some drawers don't glide very well. Ring pulls are nice. These nightstands are good not great but overall work for the space. They look nice but are slightly wobbly. They definitely need a glass top to keep from warping. I purchased two of these nightstands and the matching 2-piece Wire-brushed Black Dresser & Mirror set, which I reviewed on it's page as well. Like the dresser, I feel like the nightstands are a bit overpriced when you consider the lack of smoothness in the drawers. The piece as a whole feels robust and sturdy but the drawers feel like they belong on a cheaper nightstand. They're not awful, but for the price of this nightstand I would expect a sturdier drawer build [the material on the drawer sides is very thin] and glide system. If it had these two improvements I would rate this nightstand 5 stars. Love the black color of this furniture. Very modern and chic! Purchased the matching chest and mirror/dresser combo. Very high quality furniture! Definitely recommend! They are beautiful! The drawers glide smoothly and close softly without slamming. 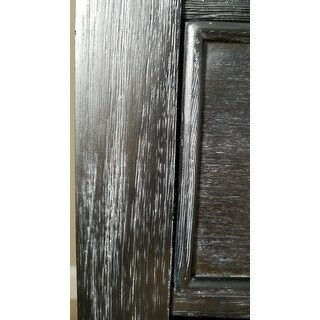 The pulls are solid and contras beautifully against the dark wood. They are substantially sized with lots of storage without being too tall. They have contemporary clean lines and coordinate perfectly with my upholstered headboard and bed frame. The brushed finish isn’t overdone but just enough to keep the pieces casual and not too formal. After weeks of searching these checked all of our check boxes and we were lucky enough to catch them on sale. Highly recommend!!! This piece is very heavy and sturdy. The handles are great quality and make the piece. I purchased this piece for a nightstand for my son’s room. It can match any black furniture. Sturdy and holds a lot! We love our 2 nightstands and especially that they arrived fully assembled. The drawers are big and hold everything we need. I love the look and especially the height. We have our bed on risers and I searched for nightstands that would be tall enough for the scale in our bedroom. These are perfect! Big, heavy nightstands. Look/feel as advertised. Pros: Nice size, they look great. 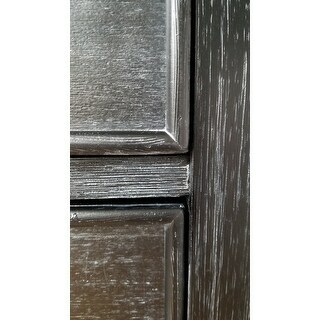 More notably distressed finish than in the photos, which we like. Cons: Wish the opening mechanism for the drawers glided more smoothly. Hoping this will improve over time as the grease is better distributed. They arrived packed very, very well; however one was initially damaged and had to be returned. As always, overstock customer service was A+ fantastic. Replacement arrived very soon, was again damaged (not overstock's fault but their customer service still had to deal w/ the problem. Customer service again stellar). Overall, great, would purchase again; hoping our experience w/ 2 out of 3 noticeably damaged pieces is a one-off from furniture of america. Love the look and the great hardware! The top drawer is even felt lined which is a great touch. The backing is faux but painted black too giving the feel of a more expensive piece. Well worth the money! Exactly what our guest bedroom needed! Very nice quality for the price. Would buy this again----its a nice finish, looks modern, good size and fits perfectly in my bedroom. Came fully assembled which was a nice feature too!! This furniture is awesome. I couldn’t believe how well built it is. I have absolutely no complaints. I bought two of these for the master bedroom and couldn’t believe how solid and sturdy they were. Beautiful piece. Spacious drawers. Very pleased. Packed very well, so it arrived with no damage. No assembly required. Just the right size and the hardware is really beautiful. Beautiful. Love that these are oversized. Black grain looks rich, overall good quality. "What is the material of the frame, legs, drawer fronts, sides and bottom? How thick is the material?" This item is constructed from a combination of solid wood, wood veneer, and plywood. "Hi, Hoping you can confirm that the sliding mechanism is working well. 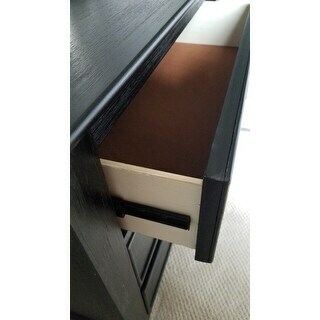 Not only open up to 3/4 of the drawer lengthy and that it slides without jamming before the drawer is fully open. I had bad experiences with some dressers in the past. Thank you"
There are no reports of difficulties with the nightstand. The drawers are not full extension. However, the drawers are deep enough that I've had no trouble reaching anything stored inside. These night stands are sturdy, attractive, easy to use. I'm very satisfied with the purchase. I have not had any problems with the sliding mechanisms. "What are the dimensions of the drawers on this nightstand?" The drawers measure approximately 21.38 inches wide x 13.13 inches deep x 4 inches high. "is this made of solid wood?" The nightstand is constructed with a mixture of solid rubber wood and wood veneers. "Does this have a smooth finish all over? I don't know if it's just lighting, but corner edges look like they were sanded for a distressed look." 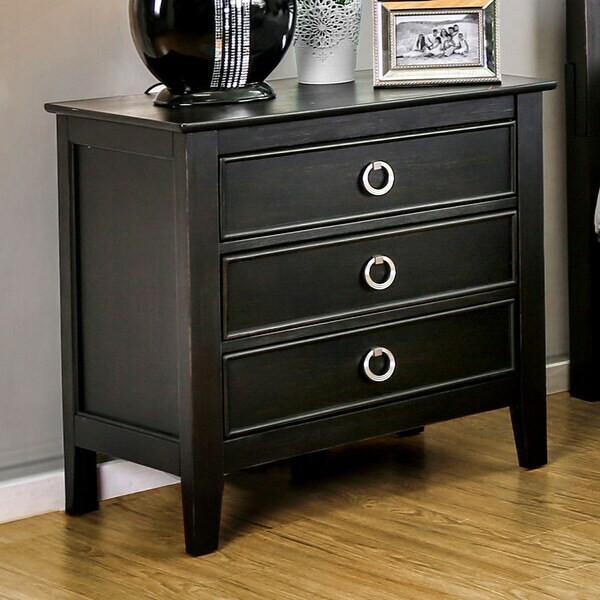 This nightstand has a smooth finish, it just has the appearance of a distressed finish.